Italian cuisine is a large part of Italian culture; sharing food with family and eating together is what makes Italian food culture distinctive. However, Italian food goes hand in hand when it comes to Italian music. Italian music is as important as Italian cuisine. People have their own preferred playlists according to their food gatherings. What goes better with Italian food and wine than Italian dinner music? Either you are cooking or eating, listening to Italian music is something must. It’s such an important part of Italian cuisine and culture. Italian music is very important of Italian dinner; if you are preparing a dinner for two, or a big dinner party, make sure that you prepare the Italian music playlist as well. A few gatherings complement music with lyrics, while some just go with Italian instrumental music. Many hosts believe that music with lyrics distracts people from the conversation; so they prefer instrumental when it’s a formal gathering or a dinner date for two. While songs with lyrics are not much of an issue when it comes to informal dinner gatherings or dinner parties with friends. Live Italian music is also preferred with a few cultural instruments such as harp, guitar or a piano. But, if you plan on having a live music session then make sure you prepare the musician for the type of music you prefer. It is advisable that you provide them with a list of preferred Italian music; you want them to sing for the audience. Certainly, the flowers, decors, food, lights etc. are very important at a dinner or a party. But, for Italians, what’s more important is good music. A good music playlist is important to keep up with the good mood of the guests, or if you are with your loved one. To save you from the hassle of creating a new playlist for your next gathering, party or dinner date. 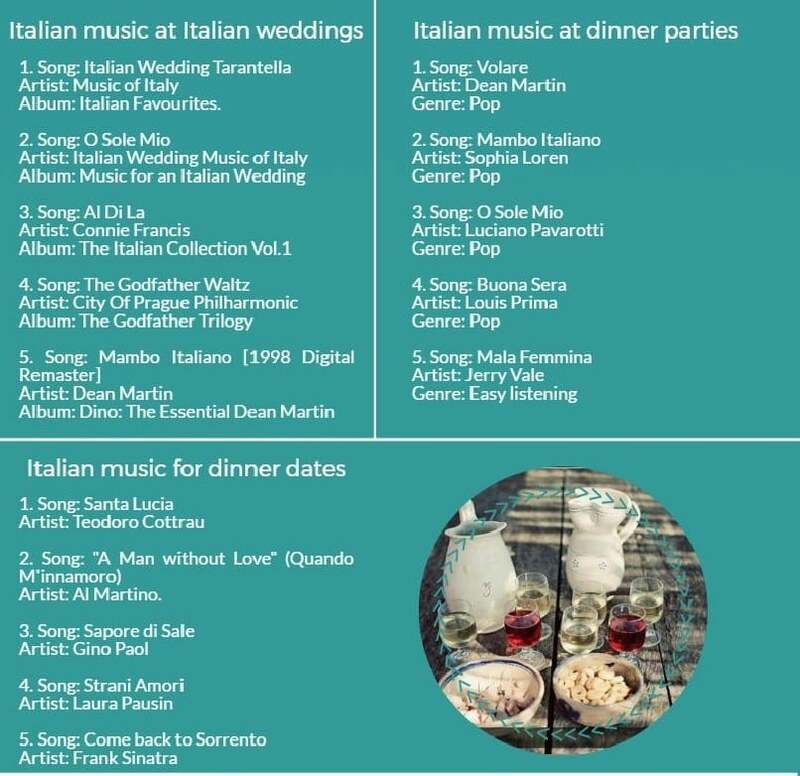 Below is the playlist of Italian music to be played in your preferred gathering. While you are at it, signing up for a cookery course in Italy might help you learning new and unique cooking skills from Italian chefs as they are passionate about food; so have fun while you learn more about Italian cooking and hum your favourite song from our recommended playlist.